The weather today was freezing cold, windy, and rainy. It was the universe taking back those beautiful summery days we had in March. At least I had an excuse to wear one of my favorite vintage coats. I don't even know what's going on with my hair, at least I am scheduled for a snip this weekend! that trench is amazing! I love the colors and the gold buttons! GORGEOUS coat!! I love your face, it's so innocent yet cheeky... sinnocent!!!! it has gone cold here, too. I love your trench a lot! 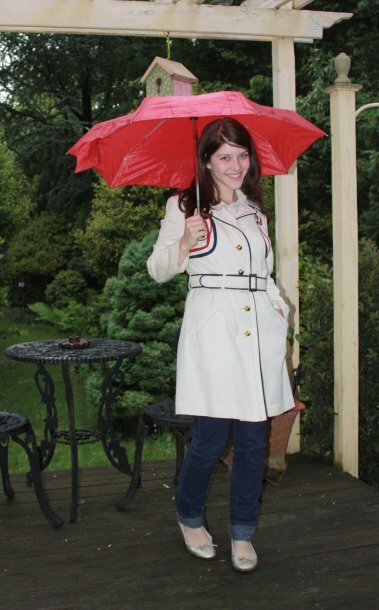 I love the trench Kallie, it is cute as hell! That last pic of you is so pretty, you need to take more close ups so I can tell you how pretty you are all the time (as stalkerish as that sounds). That trench is so amazing. Beautiful! I love all the gorgeous lining. Lovely red umbrella. Gorgeous coat, I love it! Oh the coat is amazing! The piping detail is so cute. that trench is one great find! 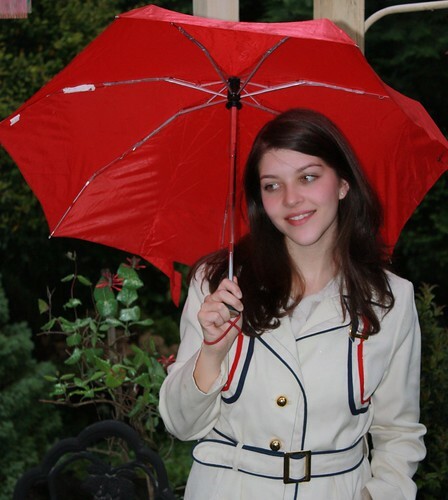 Your vintage trench is ADORABLE!! I love it! Regarding your comment about sharing clothing in college....I cracked up when you said the "sea of Abercrombie"!! That was definitely the a lot of our dorm floor as well! I transitioned out of that as I was entering college, but I think everyone went through the Amercrombie phase at some point!! adore your trench coat, it's gorgeous! I haven't been on your blog for so so long!